This design is an ideal and wonderful design for a small house. It will utilize the space of the kitchen and the dining to add grace and more utilization of space. 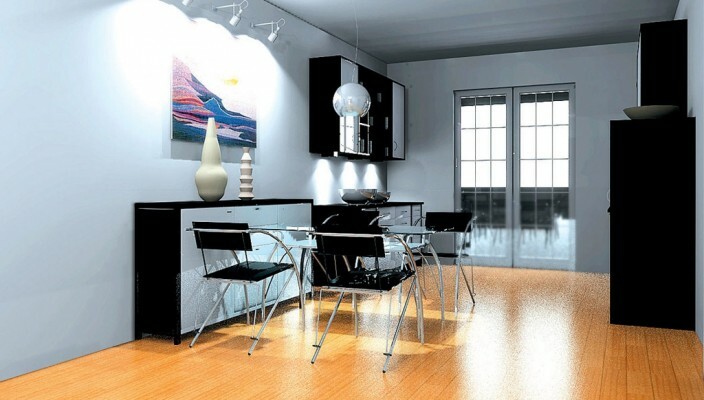 The wooden textured flooring makes a beautiful base for the entire room. The dining room is designed with simplicity and effortlessly results in a beautiful and unique design for the entire space. The kitchenette coupled with the dining space is a very useful and smart design making it easy and effortless to work in this area. This design is truly adorable and classy. The look of this set up is complete with the show items and an astonishing wall painting. The interior designer has worked well with the theme and the color contrasts so as to make this room pleasing to the eye. With wonderful work and lots of simplicity, this is just an ideal dining room plus kitchenette where preparing and enjoying food will give great delight.